To serve as an airborne reactor testbed, Convair rebuilt a B-36 in 1955 as a special model called the NB-36H Crusader. The aircraft was equipped with massive shielding and air-cooling ducting (arrows) to support a small nuclear reactor in the aft fuselage. 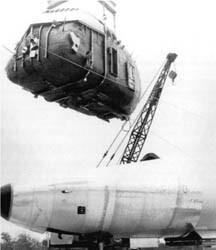 The NB-36H was essentially similar to the earlier X-6 concept, but its reactor was far less powerful and was not capable of propelling the aircraft. The reactor used in these tests was known as ASTR - the Aircraft Shield Test Reactor. It was cooled by circulation of its water moderator through heat exchangers, and produced a nominal 1 megawatt output. ASTR was installed in the NB-36H aft bomb bay in the approximate location of the full-scale P-1 reactor in order to simulate the radiation field and operational techniques of the larger propulsion reactor. The NB-36 was based at the Convair plant at Carswell AFB, Ft Worth, Texas. On reactor test missions, the aircraft would fly west to the White Sands, New Mexico area where the ASTR would be brought up to power and experiments would begin. In all, 47 flights were made with the reactor aboard and operating between September 1955 and March 1957. All flights were escorted by an instrumented B-50 bomber and a transport aircraft carrying a crew of specially-trained Marines. In event of a crash of the NB-36 the troops were to parachute to the ground, cordon off the area, and work with local emergency officials to cope with a radiological disaster. Between the extensive flight testing conducted with the NB-36 and the successful ground testing of the HTRE-3 engine, by the end of 1960 the US had established a considerable fund of engineering know-how and practical experience with aircraft nuclear powerplants. The next step would have been flight testing of the complete engine.